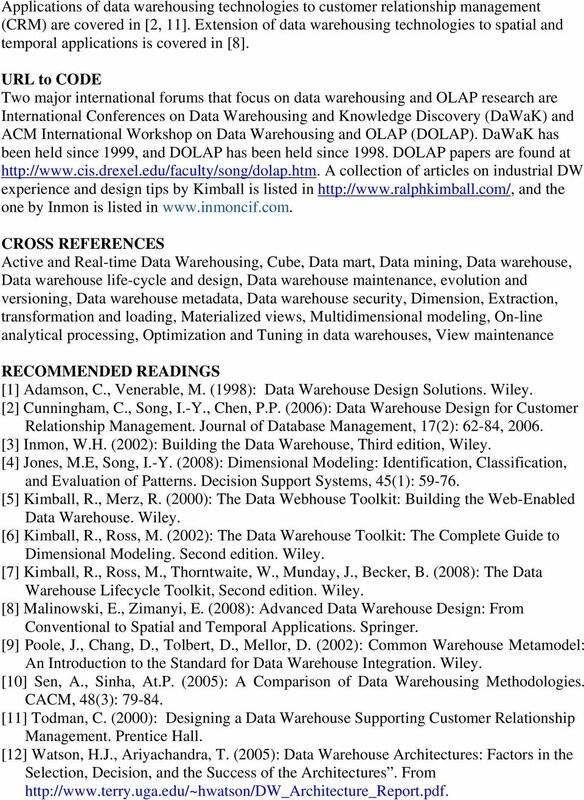 Download "Data Warehousing Systems: Foundations and Architectures"
1 Data Warehousing Systems: Foundations and Architectures Il-Yeol Song Drexel University, SYNONYMS None DEFINITION A data warehouse (DW) is an integrated repository of data for supporting decisionmaking applications of an enterprise. 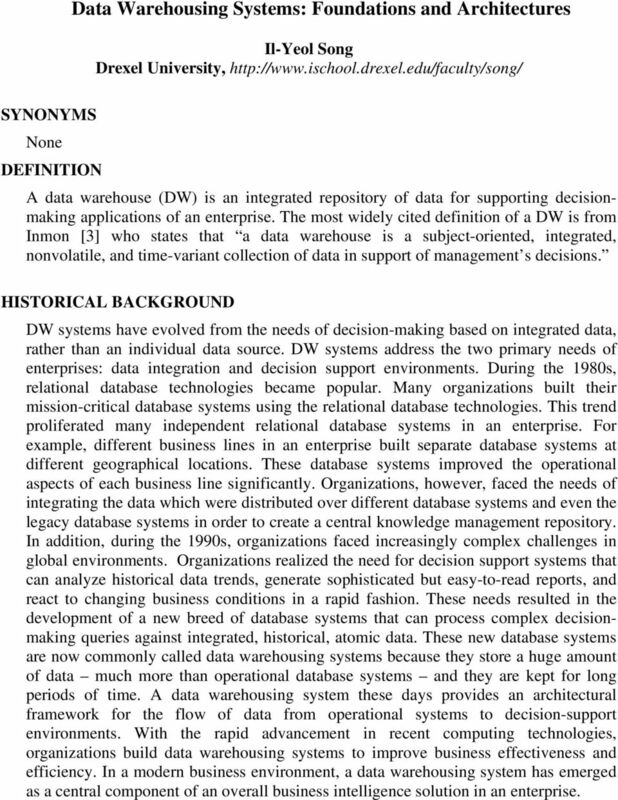 The most widely cited definition of a DW is from Inmon  who states that a data warehouse is a subject-oriented, integrated, nonvolatile, and time-variant collection of data in support of management s decisions. HISTORICAL BACKGROUND DW systems have evolved from the needs of decision-making based on integrated data, rather than an individual data source. DW systems address the two primary needs of enterprises: data integration and decision support environments. During the 1980s, relational database technologies became popular. Many organizations built their mission-critical database systems using the relational database technologies. This trend proliferated many independent relational database systems in an enterprise. For example, different business lines in an enterprise built separate database systems at different geographical locations. These database systems improved the operational aspects of each business line significantly. Organizations, however, faced the needs of integrating the data which were distributed over different database systems and even the legacy database systems in order to create a central knowledge management repository. In addition, during the 1990s, organizations faced increasingly complex challenges in global environments. Organizations realized the need for decision support systems that can analyze historical data trends, generate sophisticated but easy-to-read reports, and react to changing business conditions in a rapid fashion. These needs resulted in the development of a new breed of database systems that can process complex decisionmaking queries against integrated, historical, atomic data. These new database systems are now commonly called data warehousing systems because they store a huge amount of data much more than operational database systems and they are kept for long periods of time. 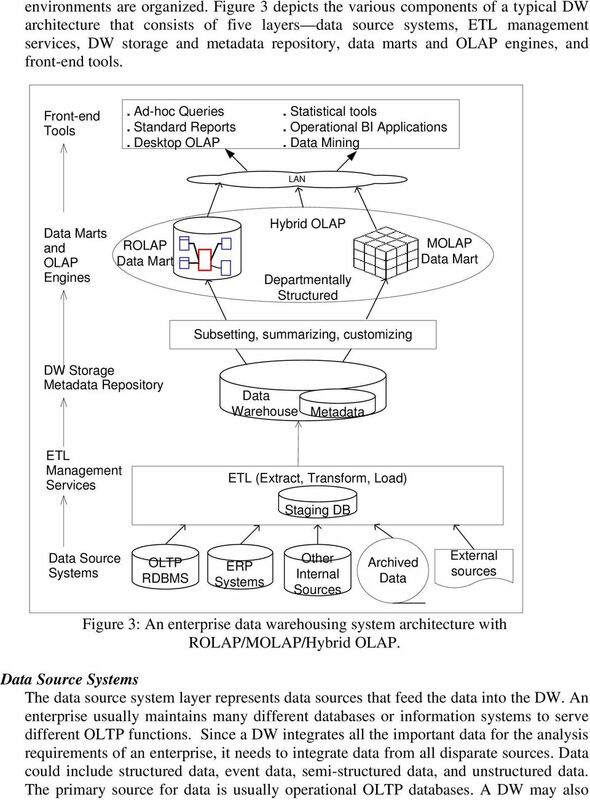 A data warehousing system these days provides an architectural framework for the flow of data from operational systems to decision-support environments. With the rapid advancement in recent computing technologies, organizations build data warehousing systems to improve business effectiveness and efficiency. In a modern business environment, a data warehousing system has emerged as a central component of an overall business intelligence solution in an enterprise. 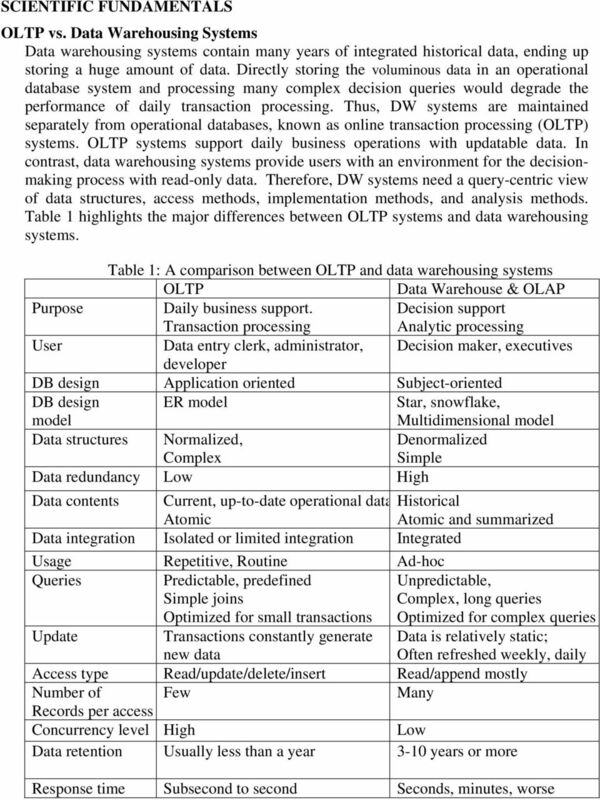 3 Systems requirements Transaction throughput, Data consistency Query throughput, Data accuracy ROLAP & MOLAP The data in a DW are usually organized in formats made for easy access and analysis in decision-making. 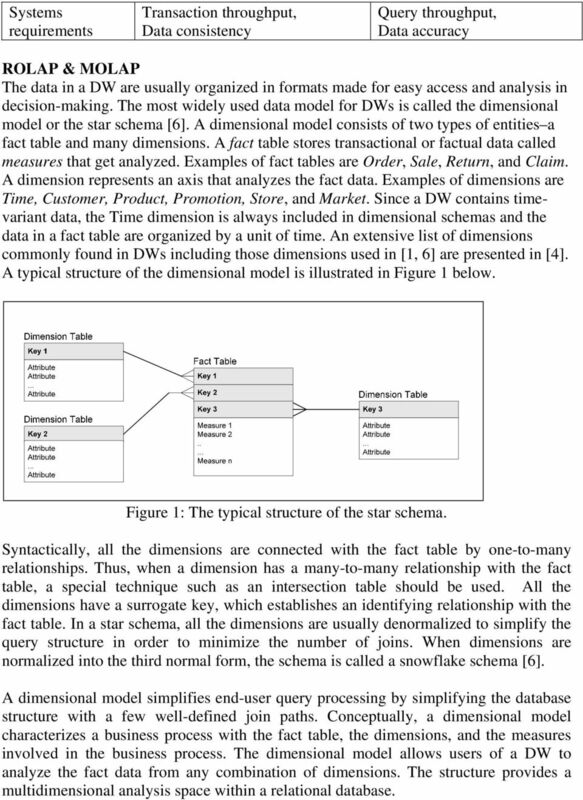 The most widely used data model for DWs is called the dimensional model or the star schema . A dimensional model consists of two types of entities a fact table and many dimensions. A fact table stores transactional or factual data called measures that get analyzed. Examples of fact tables are Order, Sale, Return, and Claim. A dimension represents an axis that analyzes the fact data. Examples of dimensions are Time, Customer, Product, Promotion, Store, and Market. Since a DW contains timevariant data, the Time dimension is always included in dimensional schemas and the data in a fact table are organized by a unit of time. An extensive list of dimensions commonly found in DWs including those dimensions used in [1, 6] are presented in . A typical structure of the dimensional model is illustrated in Figure 1 below. Figure 1: The typical structure of the star schema. Syntactically, all the dimensions are connected with the fact table by one-to-many relationships. Thus, when a dimension has a many-to-many relationship with the fact table, a special technique such as an intersection table should be used. All the dimensions have a surrogate key, which establishes an identifying relationship with the fact table. In a star schema, all the dimensions are usually denormalized to simplify the query structure in order to minimize the number of joins. When dimensions are normalized into the third normal form, the schema is called a snowflake schema . A dimensional model simplifies end-user query processing by simplifying the database structure with a few well-defined join paths. Conceptually, a dimensional model characterizes a business process with the fact table, the dimensions, and the measures involved in the business process. The dimensional model allows users of a DW to analyze the fact data from any combination of dimensions. 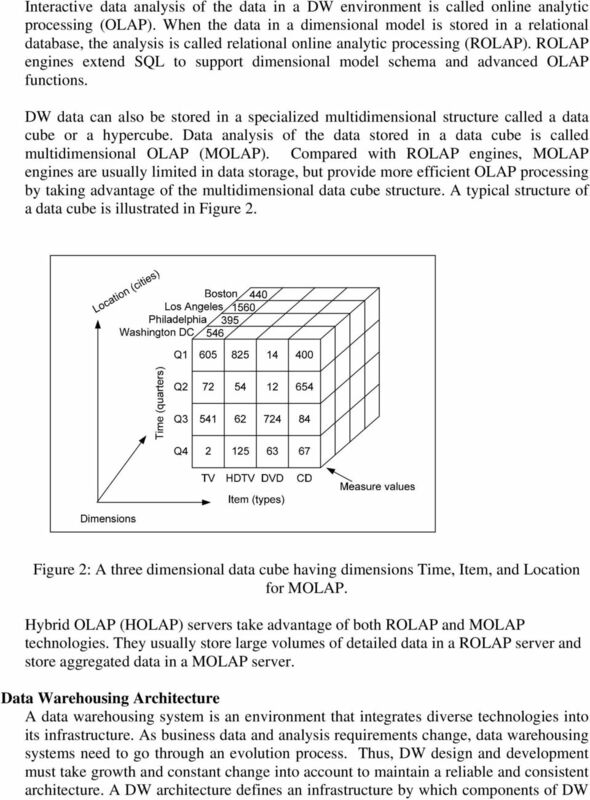 The structure provides a multidimensional analysis space within a relational database. 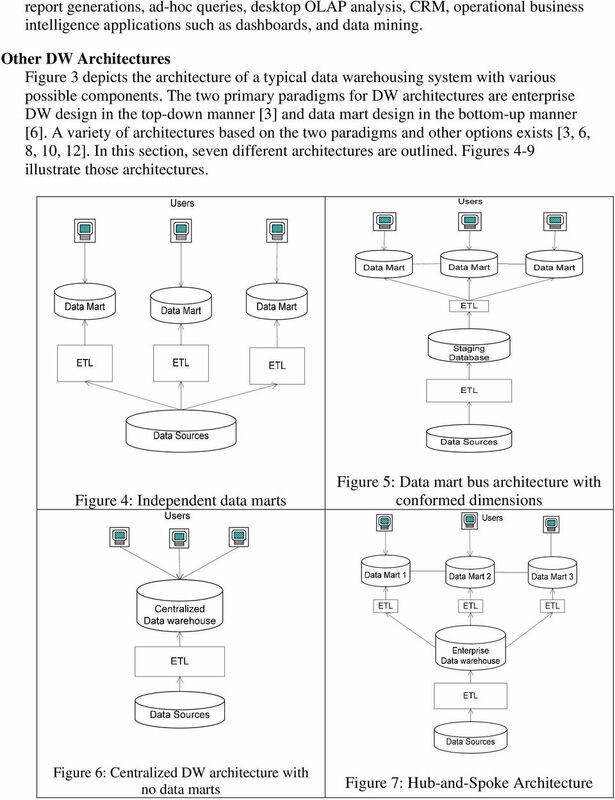 10 In this architecture, a single enterprise DW, called the hub, is created with a set of dimensional data marts, called spokes, that are dependent on the enterprise DW. The warehouse provides a single version of truth for the enterprise, and each data mart addresses the analytic needs of a business unit. This architecture is also called the corporate information factory or the enterprise DW architecture . The warehouse contains data at the atomic level, and the data marts usually contain either atomic data, lightly summarized data, or both, all fed from the warehouse. The enterprise warehouse in this architecture is usually normalized for flexibility and scalability, while the data marts are structured in star schemas for performance. This top-down development methodology provides a centralized integrated repository of the enterprise data and tends to be robust against business changes. The primary weakness of this architecture is that it requires significant up-front costs and time for developing the warehouse due to its scope and scale. 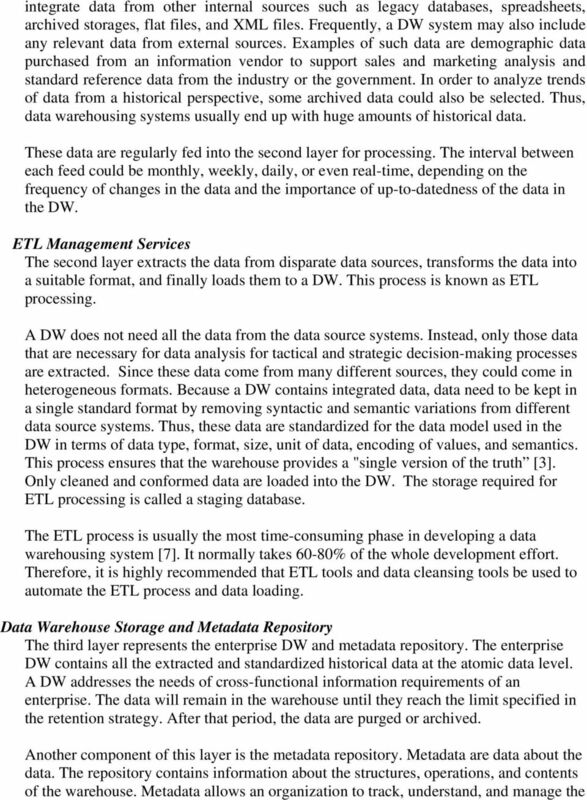 Distributed Data Warehouse Architecture A distributed DW architecture consists of several local DWs and a global DW . Here, local DWs have mutually exclusive data and are autonomous. Each local warehouse has its own ETL logic and processes its own analysis queries for a business division. The global warehouse may store corporate-wide data at the enterprise level. Thus, either corporate-level data analysis at the enterprise level or global data analyses that require data from several local DWs will be done at the global DW. For example, a financial analysis covering all the business divisions will be done at the global DW. Depending on the level of data and query flows, there could be several variations in this architecture . This architecture supports multiple, geographically distributed business divisions. The architecture is especially beneficial when local DWs run on multiple vendors. 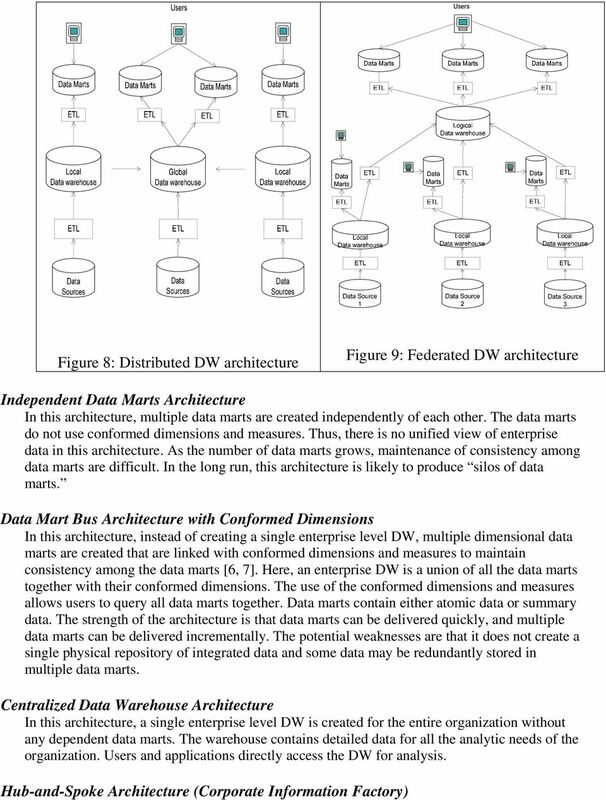 Federated Data Warehouse Architecture A federated DW architecture is a variation of a distributed DW architecture, where the global DW serves as a logical DW for all local DWs. The logical DW provides users with a single centralized DW image of the enterprise. This architecture is a practical solution when an enterprise acquires other companies that have their own DWs, which become local DWs. The primary advantage of this architecture is that existing environments of local DWs can be kept as they are without physically restructuring them into the global DW. This architecture may suffer from complexity and performance when applications require frequent distributed joins and other distributed operations. 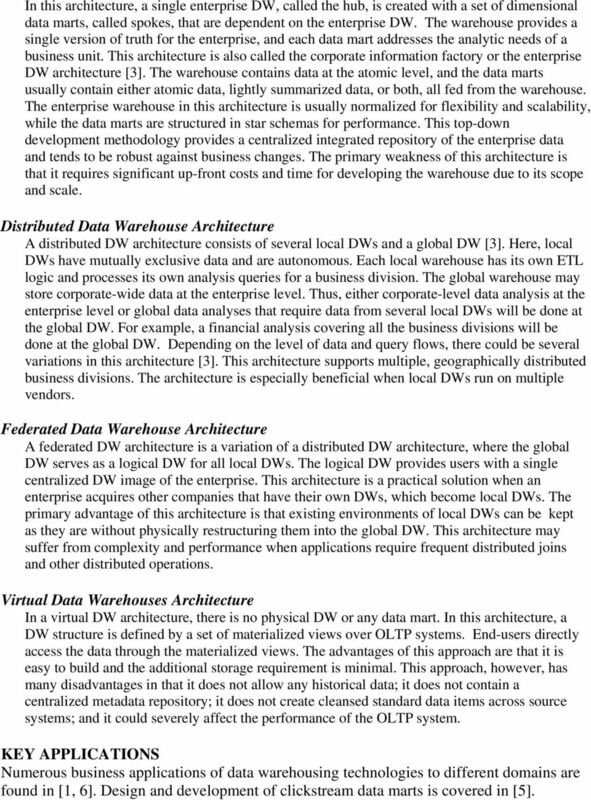 Virtual Data Warehouses Architecture In a virtual DW architecture, there is no physical DW or any data mart. In this architecture, a DW structure is defined by a set of materialized views over OLTP systems. End-users directly access the data through the materialized views. The advantages of this approach are that it is easy to build and the additional storage requirement is minimal. This approach, however, has many disadvantages in that it does not allow any historical data; it does not contain a centralized metadata repository; it does not create cleansed standard data items across source systems; and it could severely affect the performance of the OLTP system. 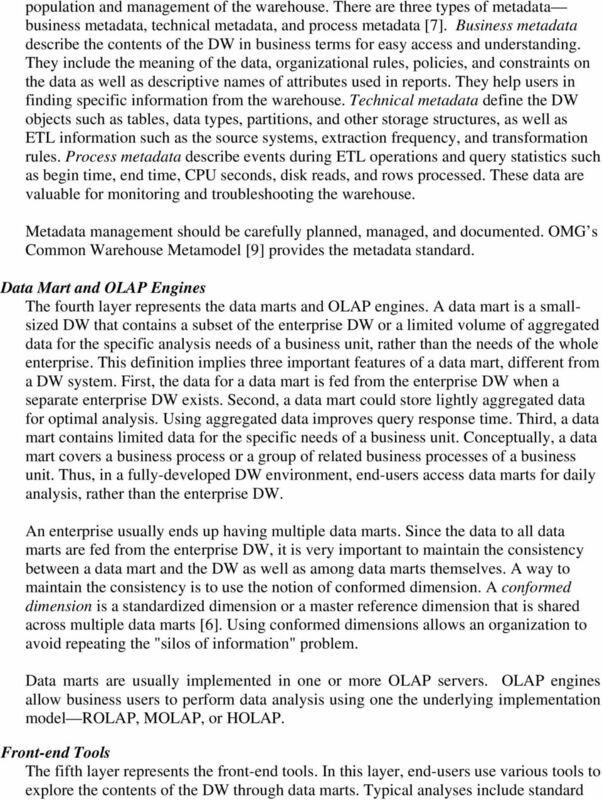 KEY APPLICATIONS Numerous business applications of data warehousing technologies to different domains are found in [1, 6]. Design and development of clickstream data marts is covered in .